In many ways, the main difference between a professional and an amateur is really a paycheck. The moment someone gets paid for their services they have crossed over into the realm of being a professional. Being a professional also means there is a certain level of responsibility embraced by that individual or business in terms of complying with local laws and regulations. In other words, a professional comes with an added level of certification. Take for instance a professional plumber. This is someone who has been trained in the industry and has been certified by the trade. They would also be licensed and insured. All of this means that the plumber you bring into your home should know what they are doing. They will also be well-versed in all matters of compliance when it comes to installation and repair of all your plumbing needs. The opposite of this would be getting a friend to fix your plumbing. Their intentions are certainly noble but their skill set might be lacking. Just because they can unscrew a hose connection doesn’t make them a professional. Would you really want to trust something as important as your plumbing to someone who wasn’t a professional? Now apply that same definition to your local Albany junk hauling companies. You might think that a junk hauler doesn’t have to be professional. After all, how complicated can it be? While it might not be a complicated assignment that doesn’t mean you should invite just anyone into your home. If you have some large bulky junk items that need to be removed from your home, you could call upon some Albany day laborers to help get them out of the house. But with that choice, do you really know who you’re letting into your home? Will you have any chance of following up with them if something goes wrong or worst, something goes missing? A professional Albany junk hauling team like Junk King is a certified and trustworthy business. All the professional junk haulers at Junk King have been checked out in terms of having a good employment record. They will also be trained. This matters when large and heavy objects are being moved from your home. The last thing you want is for some amateur mover to drop a sofa or scuff up a wall. There are also ways to lift heavy objects that can reduce the risk of injury. Professional Albany junk haulers like Junk King will also come with their own junk hauling customized truck. Most importantly, they will know where to dispose of this junk properly. Once you’ve paid off those day laborer amateurs there is no telling where they might dump your junk. As with any service, it’s always best to go with the professionals. This entry was posted in Albany Junk Hauling, Albany Junk Removal, Get Rid of Junk Albany, Junk King Capital District and tagged Albany Junk Hauling, Albany Junk Removal, Get Rid of Junk Albany, Professional Junk Removal on November 30, 2011 by Todd Porter. Last updated August 1, 2017 . Public protests have spread to many cities around the country including right here in Albany. However, the protesters in Albany simply can’t last as long as some of the other gatherings around the country for the simple fact that there are some very brutal winters in Albany. Once a protest like this or any major gathering of folks moves on you can bet there is going to be a huge mess left behind. Often it will fall to municipal workers to clean up the mess. Those workers don’t really mind because they’ll be getting overtime pay. As a homeowner or business, imagine if you could have the benefit of having professional junk haulers show up before or after your next gathering to haul away all the junk? Actually, that can now happen, when you call upon the services of the Junk King Albany. The new Albany junk removal team is part of the growing nationwide Junk King franchise whose mission statement is to help you clear the clutter from your life and make you feel like a king. 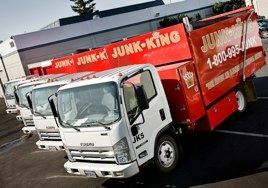 While it makes sense to schedule a Junk King pick-up after a huge party or event, there is no reason why you can’t call on Junk King anytime throughout the year. In fact, many satisfied customers already know they can depend on the Junk King crew to handle all kinds hauling services. For instance, consider using a Junk King Albany crew to make some extra room for the upcoming holidays. There might be some family or friends who you’ve invited for a visit. Do you have enough room for them to be comfortable? If you need to clear out the clutter from your spare room then Junk King is the only call you need to make. You could literally open the door to any room in your home and tell the Junk King crew to “take it all away.” In short order, they’ll clear out the room to the bare walls if you’d like. You can then wave good-bye to all that junk as they pull away from your home in their huge junk hauling truck. Of course, most junk removal assignments are a bit more targeted, but just as effortless for Junk King. A popular method for designating which junk you want removed from your Albany home is to tag it with a note. You can then relax in your living room as your junk goes flying out the front door! If you are so inclined, you could pile up all your junk in the driveway for an easy removal but why add the hassle for yourself when the Junk King Albany team is perfectly capable of removing any item from any space in your home without causing any damage or hassle. What it takes to hire the Albany Junk King crew is a phone call to 1-800-995-JUNK. If you want, you can have them give you a free on site estimate prior to moving forward with the job. It’s than as simple as the crew showing up, loading up and driving off with your junk. It’s just that easy and there is nothing to protest with that process! This entry was posted in Albany Junk Hauling, Albany Junk Removal, Junk King Capital District and tagged Albany Hauling, Albany Junk Removal, Get Rid of Junk Albany, Junk Hauling Albany, Junk King Albany on November 22, 2011 by Todd Porter. Last updated August 1, 2017 .